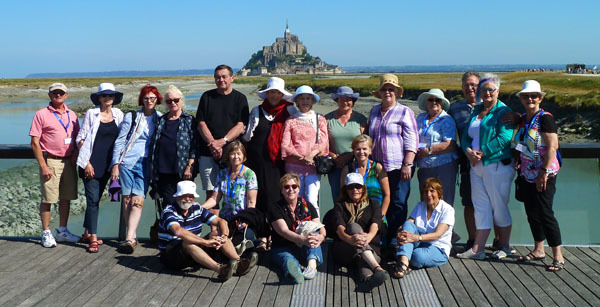 I recently returned from my Travelrite International painting holiday in France where the group of 21 spent a week in Paris painting the iconic Notre Dame, Sacre Coeur and Montmartre, the Eiffel Tower, the barges along the Seine, the front of the Louvre and the Jardin des Plantes. All painting locations were chosen by myself after an intense days reconnoitre. We used the Metro and buses hired by Travelrite to get around and it was an exciting way to get to the painting locations. The first day we had a guided bus tour of Paris and even having been there many times before, it showed me places that I hadn’t discovered. We stayed in a boutique hotel on the Left Bank Latin Quarter within walking distance of Notre Dame, ate at excellent cafes and restaurants, practised our French and enjoyed the fine weather and wine. At the end of the very busy first week we travelled by bus to St. Malo in Bretagne for an even busier second week, stopping at Giverny to visit Monet’s house, garden and lily pond. Another treat for everyone! The water lilies are quite marvellous, as imagined, and I was quite awestruck. 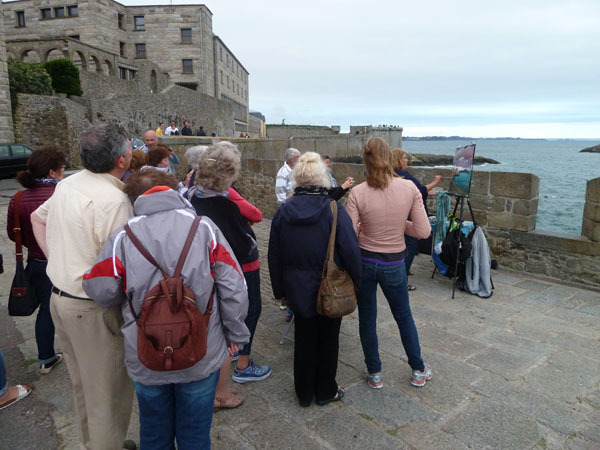 Arriving at St. Malo we were once again overcome by this amazing ancient town surrounded by huge high fortress-like rampart walls. The call of the English sounding gulls was quite romantic. We walked the very high walls and explored the mysteries of the town and dined out each night at the wonderful street cafes. 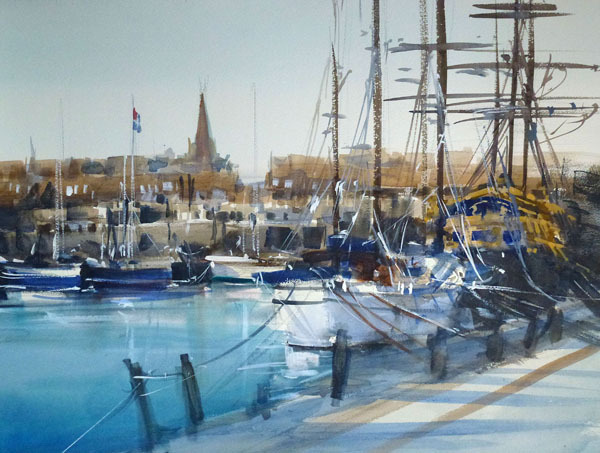 We painted the views of the sea and walls, the beaches, the tall ships, the lane-ways and the hotels from easily accessed vantage points. I make sure students are comfortable where they paint from with easy access to amenities, food, shelter, seating and of course a marvellous scene. 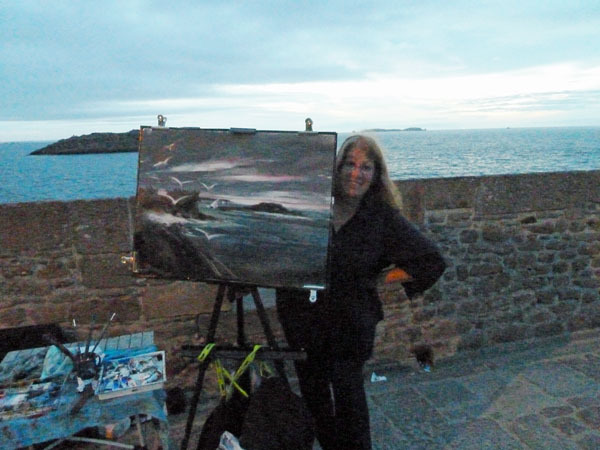 I do full sheet demonstrations en plein air at every location, painting vertically so every student can see and follow my instruction. 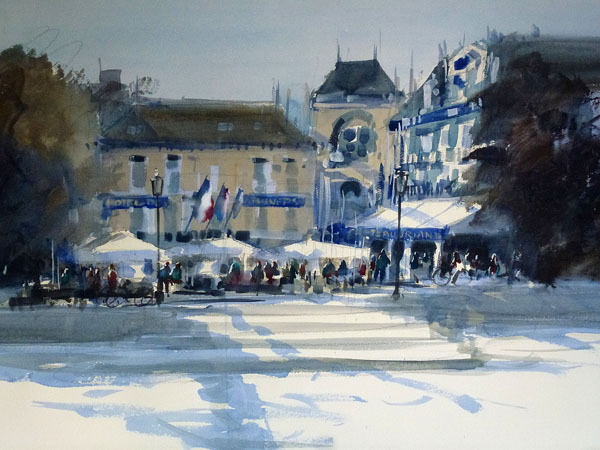 My demos usually take 45 minutes and then everyone has two hours to paint their own work with coffee and cakes along the way! 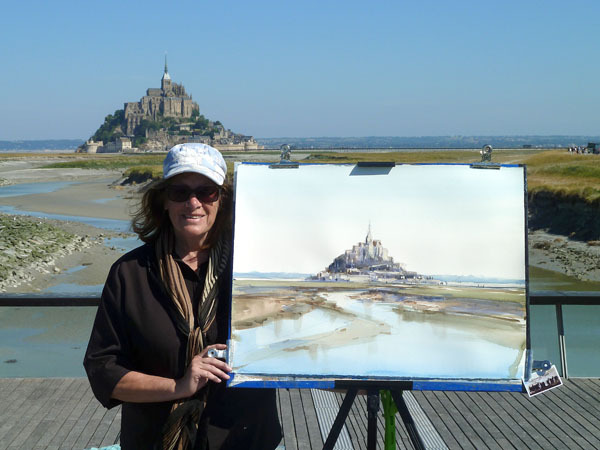 We had three day trips, the first to the iconic Mont Saint Michel where we painted from a viewing platform and then we visited the Mount. 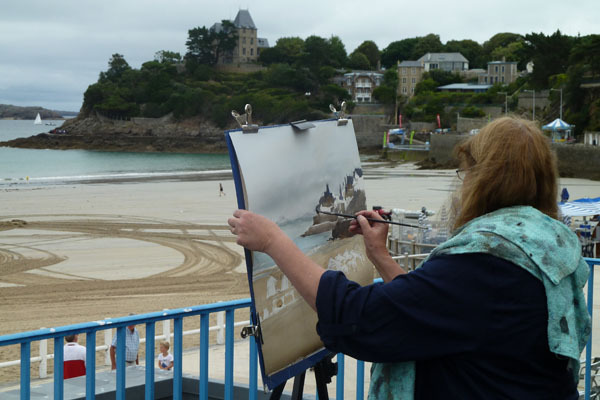 Another day was spent at Dinan, a river town where we painted along the Rance River. 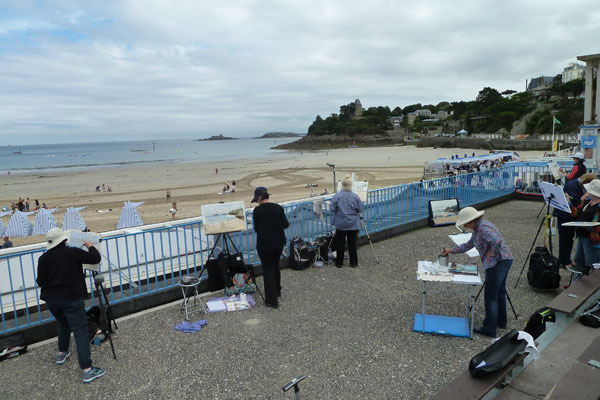 The last trip was to Dinard, where we painted from the beach the view across to St. Malo. 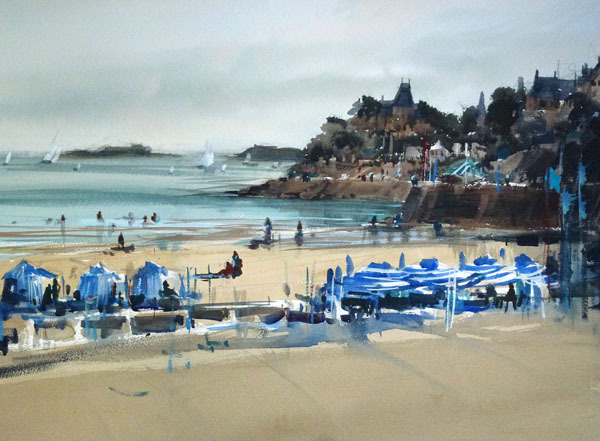 We then explored the medieval town of Dinard and again enjoyed the wonderful French food. As always, Travelrite is an excellent company and I thoroughly enjoyed my 9th trip with them. Please come with me to Sicily and Bagno Vignoni in Italy next year. Meanwhile please enjoy some images of the trip. 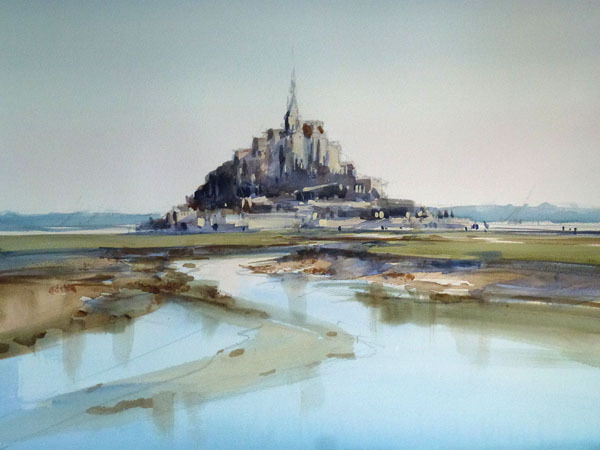 I will be having an exhibition of my work from France ( “A French Affair” ) at Seaview Gallery, Queenscliff on October 9th. All are welcome. Please contact me (ajh.watercolour@gmail.com ) for details. Please enjoy the images below. Note all paintings remain the copyright of Amanda Hyatt.